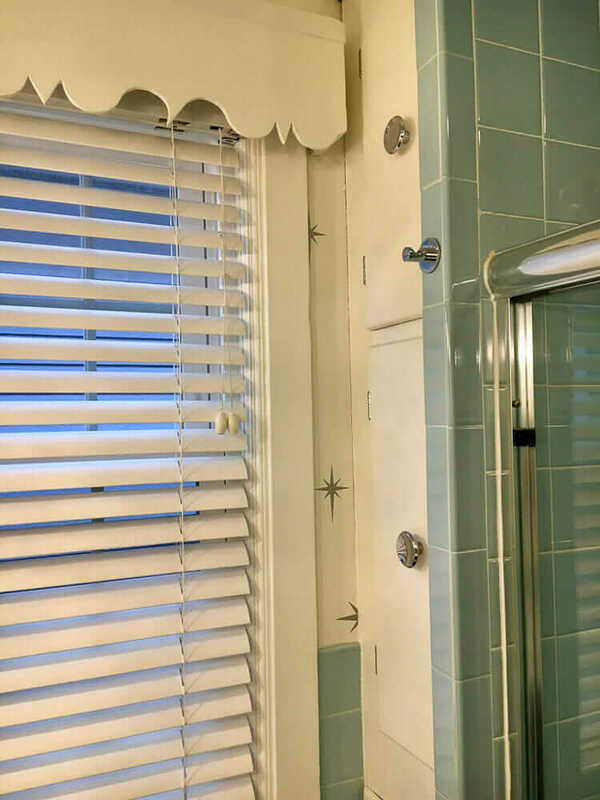 Baby in vintage bathroom on board! 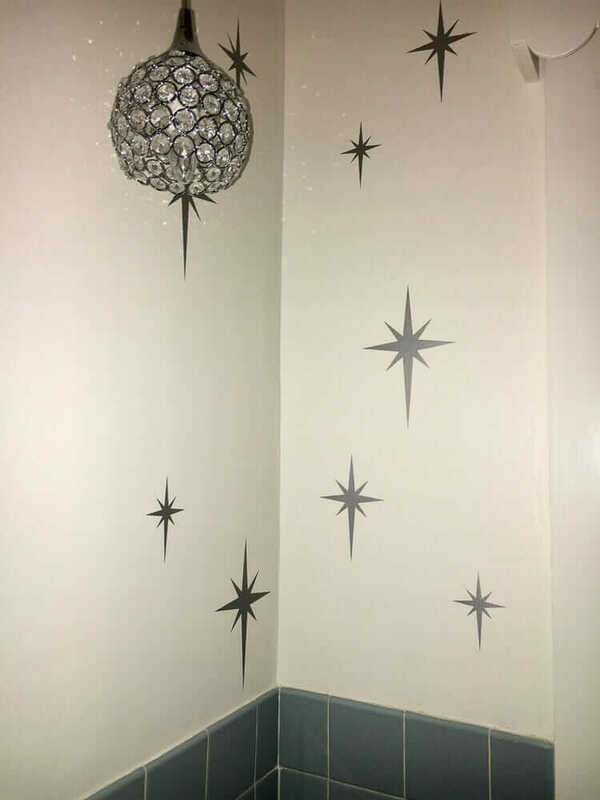 I “met” Leila on our Facebook page and was entranced by her bathroom makeover, which was driven by her desire to create a wallpaper look but with decals. 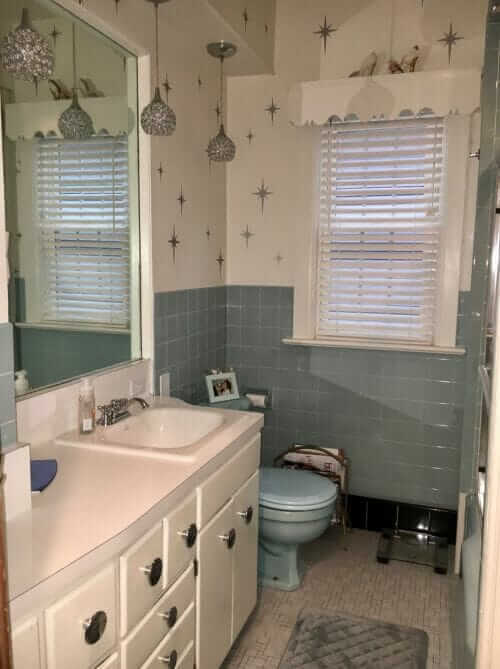 All the more fascinating: This is the house she grew up with — and she even shared photos of her as a baby in this same bathroom — yes, that’s Leila, captured in Kodak circa 1961, in the classic pink-blue-black tile bathroom before her mother started switching things up! The bathroom today — after Leila’s mom changed the tile years ago… and after Leila did some of her own decorating recently. 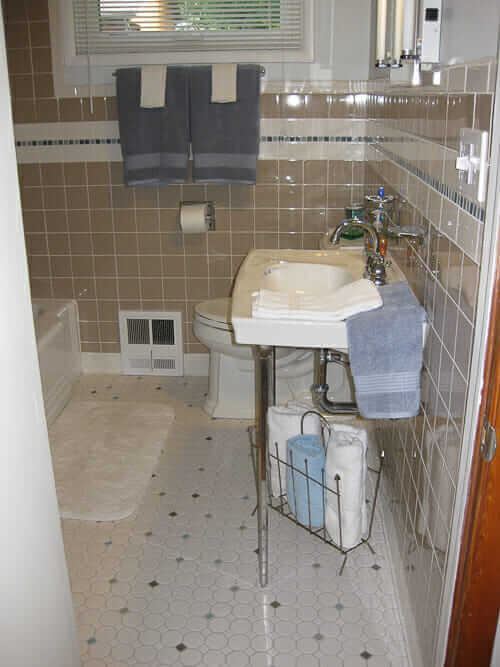 Yes, I’m thrilled that you are interested in using my bathroom on your blog. 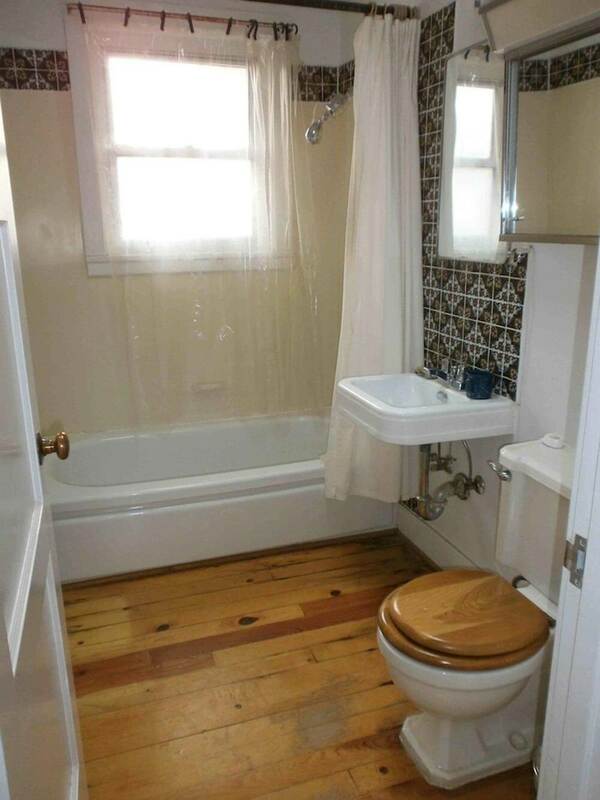 This is a small bathroom in an upstairs flat in snowy Buffalo. I started out wanting to change the very dated wallpaper that I had with some starburst mid-century pattern wallpaper. When I could not find exactly what I wanted, I investigated other options. I decided to try decals, and I found exactly what I wanted on Etsy. The hardest part was trying to figure out the placement so that they looked random. I cut out some foil in the same shapes and taped those to the wall first -to play around with the placement before I actually put on the decals. I also changed the hardware from wood block pulls to huge, mid-century round knobs which I also found on Etsy. 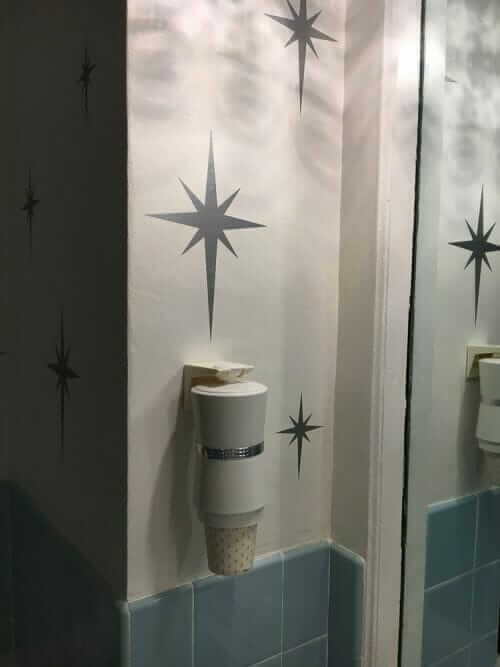 I scored the vintage Dixie Cup dispenser at a flea market — brand new with silver starburst cups to match! The scalloped valance was handmade by my father in the 1950s and I treasure it. These inexpensive changes completely transformed my bathroom. I admire it every day while getting ready for work. Now I just need a soap dispenser and some towels with a mid-century vibe! Thanks. Here are two pictures that span 50+years. 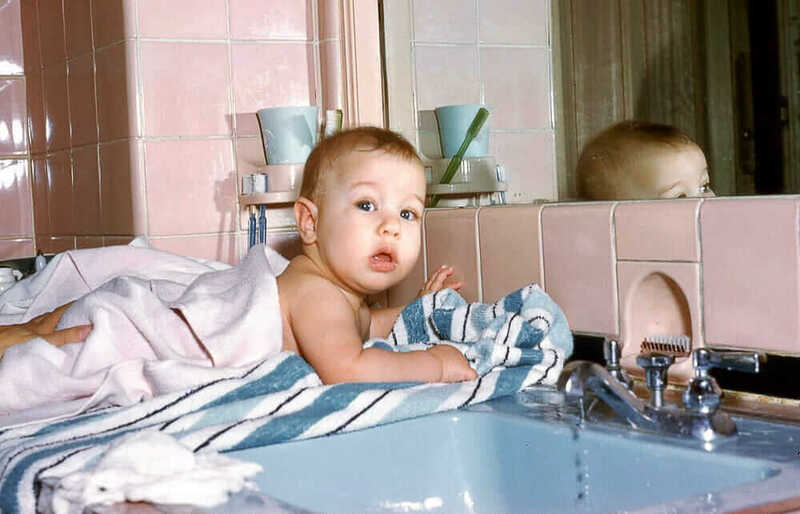 That’s me after my bath circa 1961…. …. and here I am today sitting in that same spot in front of the mirror. 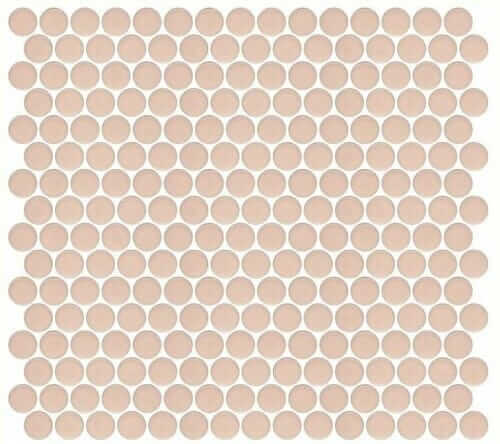 The bathroom tiles used to be pink. Don’t hate me — I had nothing to do with their demise. Blame it on my progressive mother who was always changing with the times. And like you always say, you have to work with what you’ve got — so I’m trying my best to highlight the vintage features that do remain. 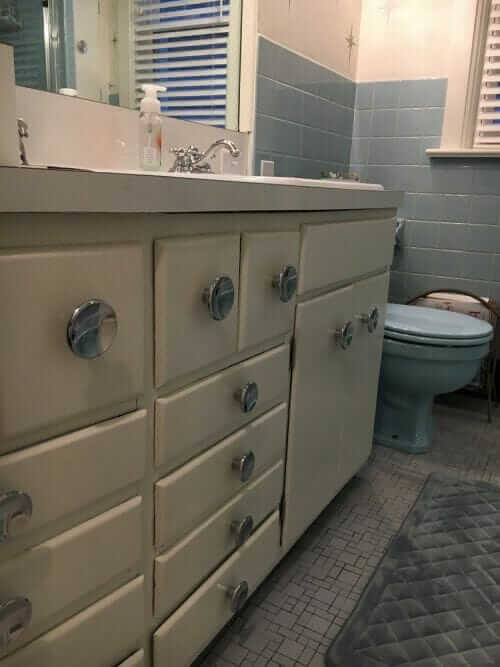 This bathroom is packed with built in storage, as you can see. The cabinetry was all handmade by my father back in the 50s. It’s almost primitive compared to today’s standards. There are no drawer slides and some drawers are cockeyed, but I love it because it came from his hands. 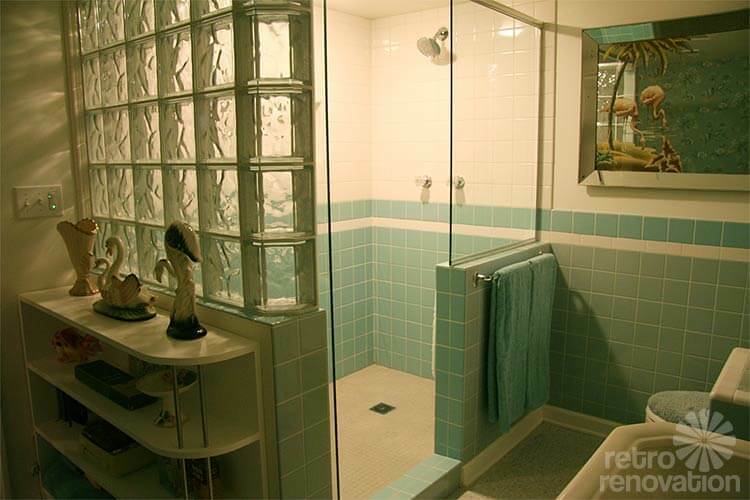 There is even a door behind the shower that opens to easily to access the plumbing. But by far, the most genius part is the huge swing out, hinged laundry hamper shown in the picture. It is practically hidden yet conveniently placed for dirty clothes and towels. Every house should have this! Fabulous, Leila. I love love love it! What a treasure to this home, and you are a wonderful caretaker! Thank you for sharing your story and all these photos with us! BLUE TOILET LIVES! I love this bathroom so much. Weren’t pastel fixtures awesome?!!! Even the less than desirable colors (for some people) leading into the oranges, golds, browns, and avocados of the seventies were so much better than the eighties….when “almond” and “Navaho white” entered the lexicon ??????? ?…I know we’re not supposed to say hate..but much/all of the eighties engendered that in me…. uugghhh “almond” ….just…sorry to say it, but……BAD…???? 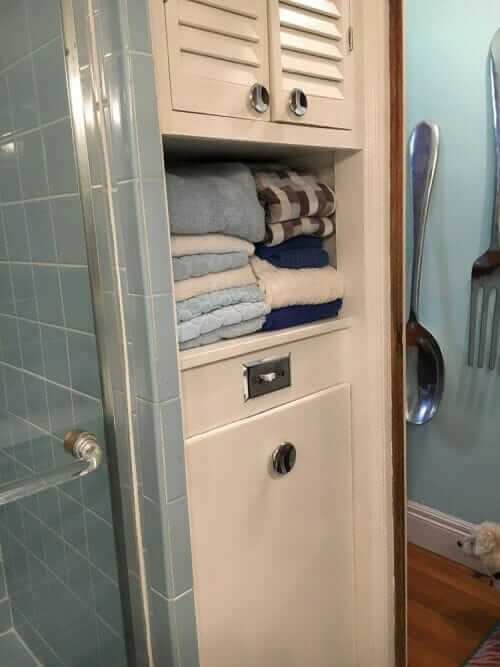 What is the light switch for that is above the tilt out hamper? It’s for the overhead ceiling light in the bath/shower. Doesn’t everybody have a light in their shower? Could we see more pictures of that lovely bath? (Rest of your house, too.) Oh please, oh please! In houses of long ago, I remember those great ideas — plumbing access, laundry hampers, angled counter and cabinets. Worthy concepts that deserve a comeback. Pam will be putting more pictures up at some point of some custom embroidered towels that I added to my bathroom after this write-up. Those came from my unbelievably talented sister, Lisa. You will love them! Leila….WOW..terrific job w/the stickers!!! Great placement, and so perfect I thought they were stenciled….how did you get them so smooth?? Not a “wrinkle” or bubble in site!! You were an adorable baby, and a great looking “not” baby btw ??????? ?